The U.S. military commander in charge of defending the U.S. homeland said Tuesday that he believes there are al Qaeda cells in the United States or people working to create them. Air Force Gen. Victor "Gene" Renuart said that while the terrorism threat within the nation's boundaries has increased in the past year, officials have strengthened intelligence sharing, particularly in an effort to shore up weaknesses in security at U.S. ports. "I believe there are cells in the United States, or at least people who aspire to create cells in the United States," Renuart said in an interview with The Associated Press. "To assume that there are not those cells is naïve, and so we have to take that threat seriously." He added, "Am I concerned that this will happen this summer? I have to be concerned that it could happen any day." Other U.S. officials last week said they did not know of al Qaeda cells in the United States. Renuart, who took over the job as the head of U.S. Northern Command four months ago, said that to counter the growing threat, the military also needs to create two more brigade-size units to be available to respond to nuclear, chemical and biological incidents at home — because currently there is only one. A brigade is about 3,500 troops. Renuart's comments came in the wake of a national intelligence report released last week that concluded al Qaeda is using its growing strength in the Middle East to plot attacks on U.S. soil. Port security has long been identified as a key weak point, including the need to scan cargo containers coming into the country by ship. Renuart said officials are expanding their use of sensors and other technologies that allow them to track ships, including their location, their speed and other commercial information. While he would not provide details, he said there has already been "real payback" in terms of identifying vessels of concern and either checking or boarding them well before they got into U.S. waters. At the same time, he said it will be a year or two before he is able to pull together the military units he needs to better be able to respond to a chemical, biological or nuclear disaster in the U.S. The units, he said, will be made up of active duty, reserves and National Guard troops. And while portions of the brigades will be located in different states, they will be expected to train together and be able to respond quickly to a disaster. 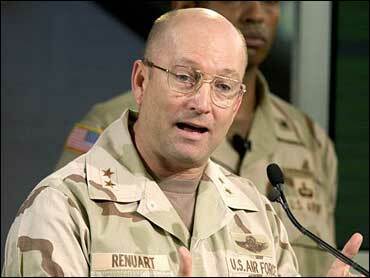 Overall, Renuart said that as the terror threat increases, the nation's ability to detect problems has also improved. The intelligence report, he said, is a "summary of drumbeats, and the drumbeats are getting more prevalent out there. You cannot afford to ignore that." But he said, a few years ago, the nation was not as able to hear and interpret those drumbeats.